Message from H. C. to return the River Cham Bill. Accessaries to Felonies, &c. Bill. Dent versus Sir W. Buck. Message from H. C. to return Goddard's Bill. Message from H. C. with it. Thornwood to Woodford, Highways, Bill. Public Accompts, for taking, &c. Bill. Weale & al. versus Supple's Bill. Town of Bawtry versus River Dar. went Bill. Hundred of Scarsdale versus River Darwent Bill. Masters of Ships, &c. versus River Darwent Bill. Town of Chesterfield versus River Darwent Bill. Prisons, to prevent Escapes from, Bill. Epus. Carlisle. Ds. Custos Magni Sigilli. March. Normanby, C. P. S.
To return the Bill, intituled, "An Act for making the River Cham, alias Grant, in the County of Cambridge, more navigable, from Hithe Ferry to the Queen's Mill, in the University and Town of Cambridge;" and to acquaint this House, that they have agreed to their Lordships Amendments made to the said Bill. Hodie 2a vice lecta est Billa, intituled, "An Act for punishing of Accessaries to Felonies and Receivers of stolen Goods; and to prevent the wilful burning and destroying of Ships." ORDERED, That the said Bill be committed to a Committee of the whole House, on Tuesday next, the First Business; and nothing to intervene. The House being this Day moved, "That a Day may be appointed, for hearing of the Cause wherein Thomas Dent Doctor in Divinity is Appellant, and Sir William Buck Baronet, William Walker, and others, are Respondents:"
It is ORDERED, by the Lords Spiritual and Temporal in Parliament assembled, That this House will hear the said Cause, by Counsel, at the Bar, on Friday the Fifth Day of February next, at Eleven a Clock. Who brought up a Bill, intituled, "An Act for the better repairing and amending the Highways, from the North End of Thornwood Common to Woodford, in the County of Essex;" to which they desire the Concurrence of this House. Hodie 3a vice lecta est Billa, intituled, "An Act to enable the Executors and Trustees of Sir Charles Ralegh to transfer to Thomas Erle Esquire Eight Hundred Pounds Capital Stock in the Bank of England, in order for Payment of the just Debts of the said Thomas Erle." 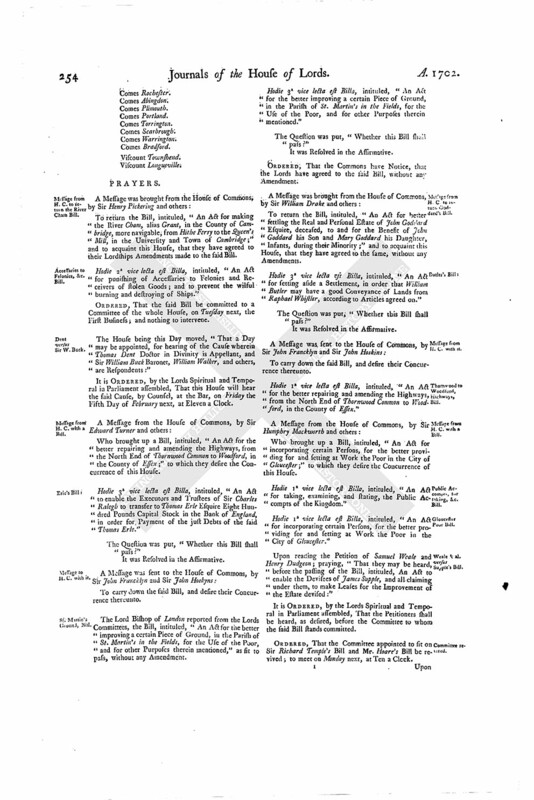 The Lord Bishop of London reported from the Lords Committees, the Bill, intituled, "An Act for the better improving a certain Piece of Ground, in the Parish of St. Martin's in the Fields, for the Use of the Poor, and for other Purposes therein mentioned," as fit to pass, without any Amendment. Hodie 3a vice lecta est Billa, intituled, "An Act for the better improving a certain Piece of Ground, in the Parish of St. Martin's in the Fields, for the Use of the Poor, and for other Purposes therein mentioned." To return the Bill, intituled, "An Act for better settling the Real and Personal Estate of John Goddard Esquire, deceased, to and for the Benefit of John Goddard his Son and Mary Goddard his Daughter, Infants, during their Minority;" and to acquaint this House, that they have agreed to the same, without any Amendments. Hodie 3a vice lecta est Billa, intituled, "An Act for setting aside a Settlement, in order that William Butler may have a good Conveyance of Lands from Raphael Whistler, according to Articles agreed on." Hodie 1a vice lecta est Billa, intituled, "An Act for the better repairing and amending the Highways, from the North End of Thornwood Common to Woodford, in the County of Essex." Who brought up a Bill, intituled, "An Act for incorporating certain Persons, for the better providing for and setting at Work the Poor in the City of Gloucester;" to which they desire the Concurrence of this House. Hodie 1a vice lecta est Billa, intituled, "An Act for taking, examining, and stating, the Public Accompts of the Kingdom." Hodie 1a vice lecta est Billa, intituled, "An Act for incorporating certain Persons, for the better providing for and setting at Work the Poor in the City of Gloucester." 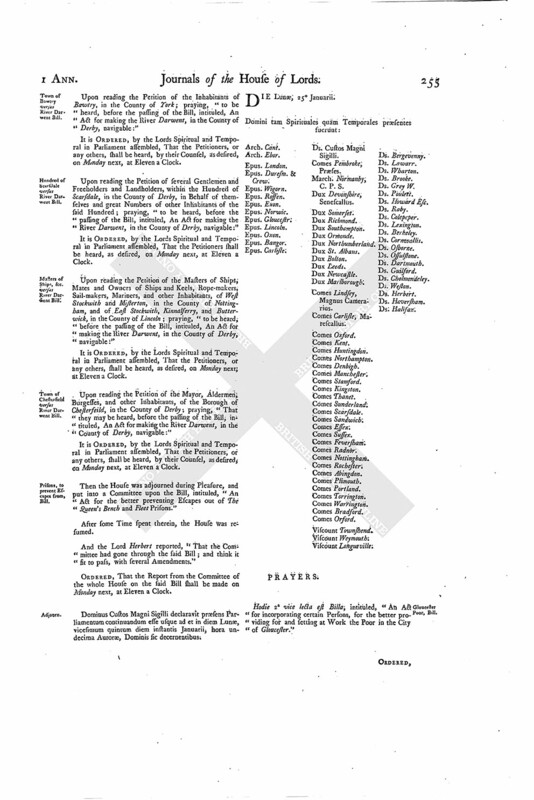 Upon reading the Petition of Samuel Weale and Henry Dudgeon; praying, "That they may be heard, before the passing of the Bill, intituled, An Act to enable the Devisees of James Supple, and all claiming under them, to make Leases for the Improvement of the Estate devised:"
It is ORDERED, by the Lords Spiritual and Temporal in Parliament assembled, That the Petitioners shall be heard, as desired, before the Committee to whom the said Bill stands committed. ORDERED, That the Committee appointed to sit on Sir Richard Temple's Bill and Mr. Hoare's Bill be revived; to meet on Monday next, at Ten a Clock. Upon reading the Petition of the Inhabitants of Bawtry, in the County of York; praying, "to be heard, before the passing of the Bill, intituled, An Act for making the River Darwent, in the County of Derby, navigable:"
It is ORDERED, by the Lords Spiritual and Temporal in Parliament assembled, That the Petitioners, or any others, shall be heard, by their Counsel, as desired, on Monday next, at Eleven a Clock. 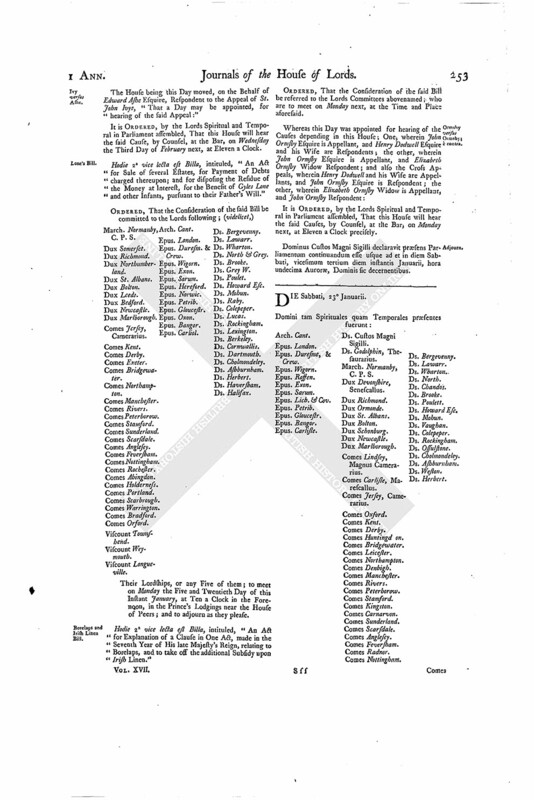 Upon reading the Petition of several Gentlemen and Freeholders and Landholders, within the Hundred of Scarsdale, in the County of Derby, in Behalf of themselves and great Numbers of other Inhabitants of the said Hundred; praying, "to be heard, before the passing of the Bill, intituled, An Act for making the River Darwent, in the County of Derby, navigable:"
It is ORDERED, by the Lords Spiritual and Temporal in Parliament assembled, That the Petitioners shall be heard, as desired, on Monday next, at Eleven a Clock. Upon reading the Petition of the Masters of Ships, Mates and Owners of Ships and Keels, Rope-makers, Sail-makers, Mariners, and other Inhabitants, of West Stockwith and Misterton, in the County of Nottingham, and of East Stockwith, Kinnalferry, and Butterwick, in the County of Lincoln; praying, "to be heard, before the passing of the Bill, intituled, An Act for making the River Darwent, in the County of Derby, navigable:"
It is ORDERED, by the Lords Spiritual and Temporal in Parliament assembled, That the Petitioners, or any others, shall be heard, as desired, on Monday next; at Eleven a Clock. Upon reading the Petition of the Mayor, Aldermen, Burgesses, and other Inhabitants, of the Borough of Chesterfeild, in the County of Derby; praying, "That they may be heard, before the passing of the Bill, intituled, An Act for making the River Darwent, in the County of Derby, navigable:"
Then the House was adjourned during Pleasure, and put into a Committee upon the Bill, intituled, "An Act for the better preventing Escapes out of The Queen's Bench and Fleet Prisons." And the Lord Herbert reported, "That the Committee had gone through the said Bill; and think it fit to pass, with several Amendments." ORDERED, That the Report from the Committee of the whole House on the said Bill shall be made on Monday next, at Eleven a Clock. Dominus Custos Magni Sigilli declaravit præsens Parliamentum continuandum esse usque ad et in diem Lunæ, vicesimum quintum diem instantis Januarii, hora undecima Auroræ, Dominis sic decernentibus.